Images, information, dimensions etc are still to be added to some pages. This note will disappear upon completion of the site. 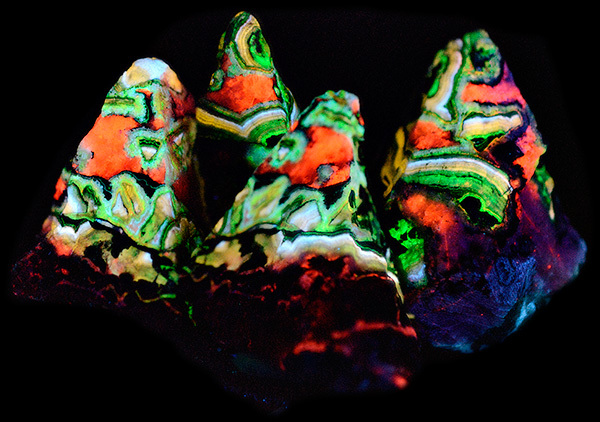 Amazing fluorescence and phosphorescence from Puttapa, South Australia. For details of this photo, click here . 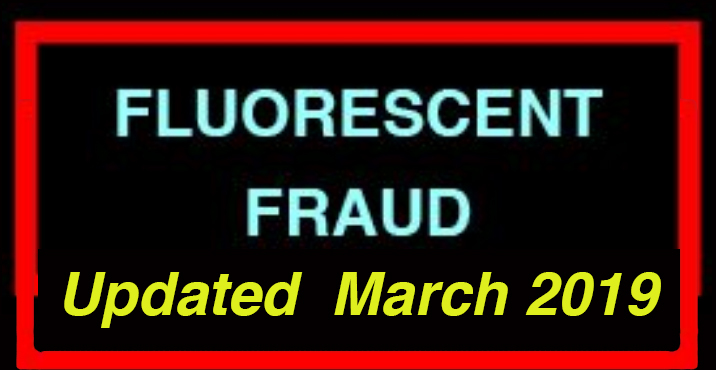 There have not been many Fluorescent Mineral collectors in Australia. 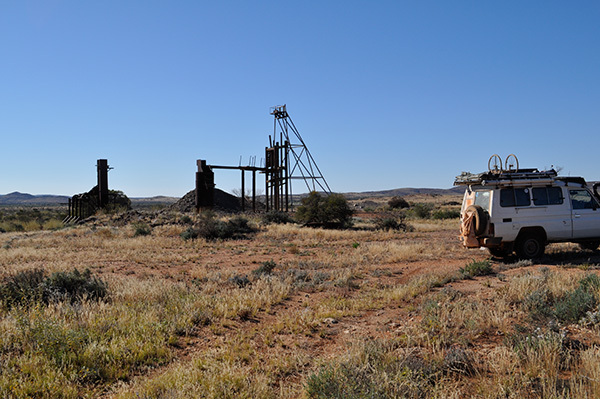 So not much is known about where to find fluorescent minerals in this Wide Brown Land, affectionately known here as OZ. Things are changing, however. Lots of people now have 4WDs and they go on trips to out-of-the-way places. People are discovering that if they take a good UV lamp with them, they can add an exciting new family activity to their holiday trips. They can find promising sites and go out after dark to see what they can find for their Fluorescent Mineral collection. And what’s more, they have embarked on a beautiful lifelong hobby. As a result, more sites are being found for enthusiastic collectors to visit. More than a billion years ago the Petermann Ranges in Central Australia were as high and as massive as the Himalayas are today. Big mountain ranges like that are pushed up from below and contain lots of minerals. So where have all our big mountains and their minerals gone? We are now nowhere near the edges of our tectonic plate. At the edges, one plate gets forced under another (subduction), forcing the upper plate to bulge and form new mountains (orogeny) with lots of earthquakes and volcanoes. Being away from all that activity (unlike our neighbours NZ, PNG, Indonesia) our land has been geologically very stable for a very long time, long enough for our big mountains to have weathered away. No more big mountains (like the Rockies or the Andes) have been pushed up in Australia for hundreds of millions of years. Most of the Wide Brown Land (not all, fortunately) is worn down flat. In fact, Australia is the oldest, flattest, driest, least fertile, least populated continent on the planet (apart from Antarctica). So where are the minerals, and in particular, where are the fluorescent ones? They’ve been spread out all over the place, so to find them we have to go looking all over the place. Among the best places to look are old mining sites where miners of yesteryear found minerals, dug them up, and left pieces lying around. 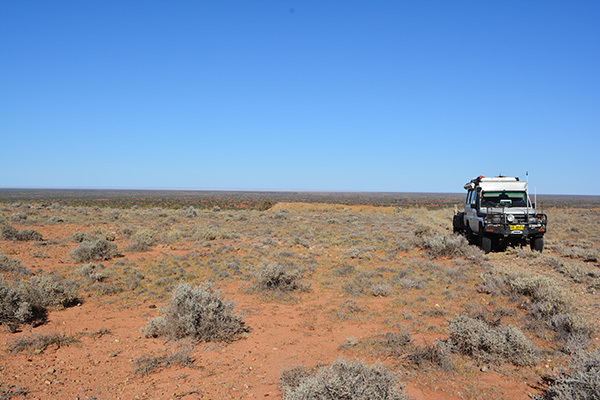 So far my main area of interest has been Outback South Australia, especially the Northern Flinders Ranges. 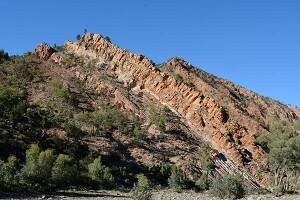 Most of the photos on this site are of scenes in or near the Flinders and of rocks I’ve found there. The rocks of the Flinders Ranges are about 550 million years old, and there is still plenty of mineralisation there, and so plenty of potentially fluorescent rocks to be found. Website design and hosting by Dynamic Web Solutions Pty Ltd.